Well I had to try some stamping, this is m20 with the Konad special polish in white. I am so liking this! I use an old credit card to swipe the paint (I read that somewhere ages ago forgot who said that) which works great without scratching my plates. This will definitely take some getting the hang of centering the image on my nail which was a huge problem on my right hand. Might have to take a little break from acrylic paint! Very pretty! I'm waiting for my konad stuff to arrive. I've been wondering how easy doing the right hand will be. Hopefully all it will take is some practise! I am so impressed with your birthday presents - what amazing hauls. Yippee! Can't wait to see these here. I have LOL and haven't tried it yet. Funnily enough I placed something of a holo order in the week that is currently sitting on my desk at work - I wasn't in the office though so will have to wait til Monday to collect it - gutted! And I am intrigued by the deep-fried ice cream. How do they do that?? And does it taste ok? Glittermillie: It's so fun and addicting you'll get hooked fast! Helen: Thank you! I can't wait to try out all my stuff! I would love to see some konad on yours nails, and I can't wait to see some new holos. Okay, the ice cream: It is sooo good, it's a scoop of ice cream and the way it doesn't melt completely is it's wrapped tightly with a thin layer of pound cake, or any dense cake, and fried long enough to cook the batter. Aaaah I'm craving it again. Kae, you've done a nice job! Very pretty. 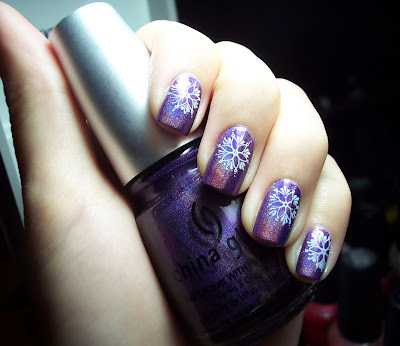 I love the holo of course and the design is so nice. Keep practicing and I'm sure you'll get better doing the opposite hand. I haven't even tried mine yet. I love looking at everyone else's artwork. Lucy: thank you, I might have to talk Alex into letting me stamp his nails for extra practice!